Oh, right, I still have this blog thing. Possibly I should pay it some attention before it withers and dies in the summer heat. 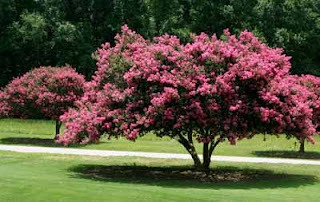 This image is a Crape Myrtle. It is an extremely beautiful blooming plant that comes in a wide variety of colors. I've seen white, yellow, the pictured pink, and a deep wine-colored Crape Myrtle that filled my wife with a desire that only a female actively planning her dream home can comprehend. The problem is, the Crape Myrtle is like cats. You see them as kittens (or bushes in this case), and you think "Aww, how cuuute!" Then you take one home and you turn your back and before you know it that cute little bush has turned into a tree that's coughing up hairballs on your couch and blocking the gate in your fence. It's July. It is hot, possibly due to global warming; there's still some debate on this point. And yet for some reason I found myself outside last night hacking apart an innocent post-shrubbery whose limbs, laden with rainwater and pink bloom, had drooped so far into our yard that they could be accurately described as a wall in some sort of saccharine hedge maze. I filled four lawn bags with the amputated foliage, and I've still got a pile of the stuff in my backyard, along with three more limbs that will need to come down shortly. And I should point out that the net effect of all this, aside from regressing the Crape Myrtle back into a cuddly shrub, is to reduce the amount of shade available in the yard. There will be sweat. In massive quantities. In less organic news, I'm coming down to the final revisions on a novel pitch for Black Library, whose submissions window closes at the end of next week. (Oh, did you think I'd link this golden opportunity in time to give you a fair shot? For shame, sir.) I think I'm writing good stuff, but I haven't got a ready stable of readers who know the background and are willing to wade through my rough copy, so... we'll see what happens. At the moment I'm alternating between writing this post and reading the sixth book in Penny Arcade's print collection, The Halls Below . This book features one of my favorite strips, along with the glorious news post that came with it in black and white. So basically, I've just given you a sample page from someone else's book. Don't sweat it. I'm generous like that. But you should probably go buy the book anyway, just to be safe.